Here is a sample picture from a ten acre install on President Jimmy Carter’s property. 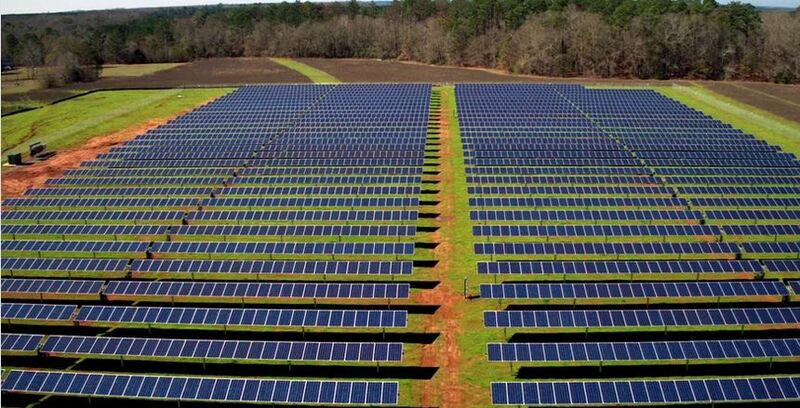 It doesn’t look exactly environmentally friendly…solar panels over grass. Hey! Get off my lawn. So there does need to be some serious discussion about the best way to harvest the sun and the best way to protect the earth at the same time! Investigators found that some of Trump’s aides engaged in contacts with people linked to the Russian regime even as the Kremlin was carrying out a wide-ranging effort to intervene in the election using hacked documents and phony social media campaign, carried out because the Russian government thought it would benefit from a Trump presidency. “Although the investigation established that the Russian government perceived it would benefit from a Trump presidency and worked to secure that outcome, and that the campaign expected it would benefit electorally from information stolen and released through Russian efforts, the investigation did not establish that members of the Trump Campaign conspired or coordinated with the Russian Government in its election interference activities,” Mueller’s report concluded. Note to Senate Majority Leader Mitch McConnell and Speaker of the House Nancy Pelosi: this wasn’t found to be a crime…going forward it should be…no must be a crime. Time for a bipartisan veto proof bill to make this illegal. Let’s not waste our time and money. If Foxconn doesn’t hold up their end of the bargain, the state’s promises to provide tax credits aren’t going to happen. And then there’s the headache of push back in Madison. We are already seeing enough Republican recalcitrance around the budget and the bad blood that developed around the lame duck sessions, laws and now court cases that we don’t need to jump into this mire. It just isn’t worth it. …(he) was glad the state has an “ironclad contract” with the firm. 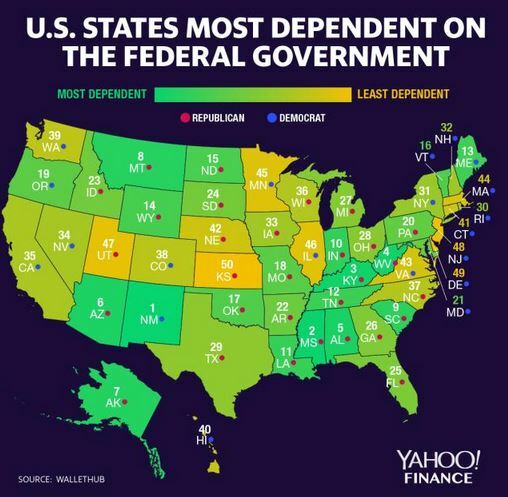 So governor…let it go. When they don’t hold up their end of the bargain…the state, Racine County, the Village of Mount Pleasant, and the residents of Wisconsin who were displaced and lost their property, sue them. Because…you know…the contract is ‘ironclad’. End of story. So let’s not spend anymore political or real capital on this issue. Let’s just watch the whole thing implode. Once hailed as “transformational” by former Gov. Scott Walker and other advocates, and touted by President Donald Trump as the “eighth wonder of the world,” the Foxconn project has been drawing increasing skepticism for the last year as the company shifted its stated plans. First came a sharp change in the proportion of factory workers to engineers. Then Foxconn gradually acknowledged that it would not build the massive “Gen 10.5” flat-screen plant specified in its contracts with state and local governments, but rather would construct a smaller, less costly “Gen 6” facility. Earlier this year, it looked like the company might back away from building any sort of factory in Wisconsin — news that prompted Trump to get on the phone to Foxconn Chairman Terry Gou, quickly followed by a public pledge by the company to forge ahead with a Gen 6 plant. “If the state is willing to renege on its commitment to Foxconn and open up a contract without agreement by both parties, then what guarantee can Wisconsin make to any other company that wants to expand here?” the Juneau Republican said in a statement. Yes, the new governor campaigned on replacing WEDC…but has since backed away from that position…and Sen Fitzgerald, et al, poisoned that well with the lame duck laws. But if you have kept up to date on the Foxconn news, the governor isn’t/hasn’t reneged on the contract…Foxconn has…and the governor wants to document the new reality. Except there really isn’t going to be one. So let’s get on with governing…work out the budget…fix our education issues…fix our infrastructure issues…guarantee clean water…and let Foxconn fail. Foxconn on Thursday reiterated its pledge to create 13,000 jobs, a commitment the company has stuck with through multiple changes to other aspects of its plans. On Thursday, Foxconn issued a statement pledging to create jobs in Wisconsin. “Foxconn remains committed to our contract with the State of Wisconsin, as well as continuing to work with Governor Evers and his team in a forthcoming and transparent manner,” the company said in its statement. Two industry experts on Thursday speculated that the manufacturing plant itself could require as few as 2,000 employees. And Rep. Robin Vos remains in La La Land! International Women’s Day in Madison Left A Sour Taste! 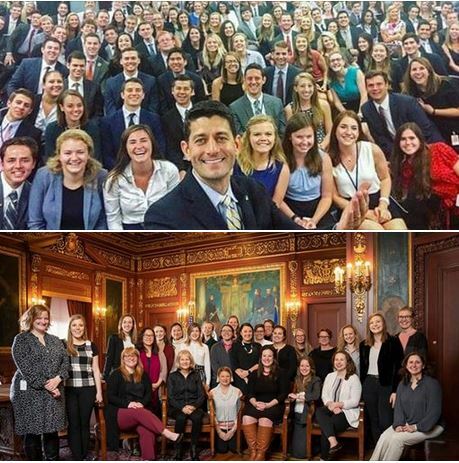 The top photo of course shows former Speaker of the House Paul Ryan with a similar sea of white in the form of the House Republican interns. Now I am sure that the governor isn’t thrilled about being compared to Rep. Ryan. He spent a great deal of time and money in his campaign to differentiate himself from the incumbent Republican. And as a supporter of the governor it doesn’t sit well with me either. 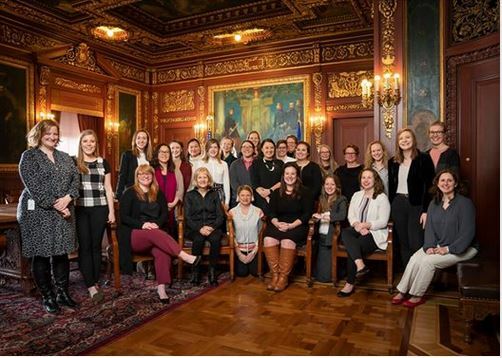 But the governor’s photo, despite celebrating the number of women working on his staff, is tone deaf given the lack of racial diversity illustrated in the picture. The governor believes that representation matters. We are proud to have a historic number of women serving in the cabinet and on the senior leadership team, but we believe that we have much more work to do to ensure that people of color are represented in the administration. And as the governor continues to fill staffing positions, there will be consideration around rounding out a diverse staff. Poster 1: Sigh. Smh. How do we continue to miss the mark on diversity and inclusion and who’s idea was this to take the photo? Poster 2: Tone deafness remains. Wants our votes but won’t mentor our folks. REMEMBER THIS POST IF FOR EVERS STAFF NOT ADMINISTRATION APPOINTEES. WHO YOU HIRE AS YOUR PERSONAL STAFF IS WHO YOU MENTOR FOR FUTURE PUBLIC SERVICE. Yes the anger, frustration and disappointment is palpable here…and rightly so. And the truth in both of these statements should be evident to any and all elected officials in office. Commenter 1: Wow. That’s disappointing. I guess that the more things change, the more they stay the same. Commenter 2: Where are the people of COLOR IN THIS NEW GOVERNOR STAFF..? Poster 2: I am looking at staff who I would interact with the most when I am advocating issues. No black folks especially a black woman is an real issue for me. Evers needs to set the example of what real diversity looks like with his staff. Madison is too white. Commenter 3: I spoke directly with Evers before his election and he told me TO ME FACE that he had a lot of appointments to make and he wanted his staff to resemble the diversity of the state. Having a few people of color in appointed positions DOES NOT reflect WI. His cabinet is mainly white old men, one black man, and a white woman. Trust that when I see him I’m calling him out. Poster 2: White folks must be all in if they want black votes PERIOD. Diversity means representation like the constituents of this state. I get tired of white people saying at least they have one or two black folks. How many times you hear at least they have one or two white people? I do know it was the female staff which is why I brought it up. Black women are the most loyal voting block for democrats. I agree there should also be black men on staff and mentored at public service. White people can’t keep getting away with there are no black to hire or find. These excerpts were selected from the two threads. You have complete comments here but I didn’t always bring over all of the conversations or the replies or the comment being replied to. I typed them so I apologize for any typos. I did not edit them other than making the selections. The comments should be entire and complete unless I mistyped something. 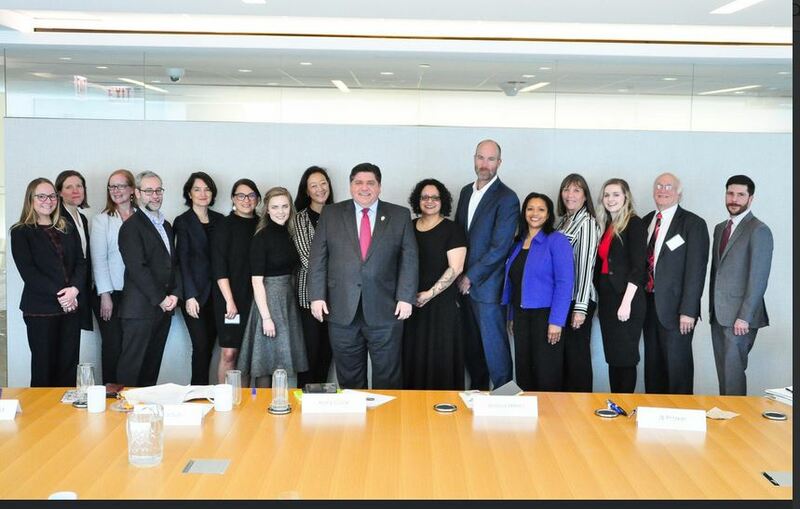 One of the threads on Facebook stated that if you increase the size of the governor’s photo, there are two Asian women in the background. That was confirmed to be true in another thread. As I said earlier, the anger here is palpable. And it isn’t new anger but one that I think was set aside after suffering under eight years of Governor Walker with high expectations for new Governor Evers. And then the disappointment from this photo just brought it all to the fore again. One question that remains unanswered (and it was broached in the threads but never clearly answered) for me is how a new governor is staffed? Is the incumbent staff carried over with only the top admins replaced? That would make sense for continuity and having experience. Or does the transition team open all of the positions and refill them? That would certainly insure having the ‘right’ staff to assist the governor but is it effective? I don’t know. Now, I am not trying to throw the governor under the bus. I wholeheartedly supported him in the general election and in his runs for superintendent of the Department of Public Instruction. But I am not making any excuses for him either. This should be an educational moment for all elected officials…departmental officials…and leaders of public profit and non-profit organizations at all levels. It’s no longer acceptable to lead and not have a diverse and inclusive team….it flat out isn’t acceptable anymore. And there is no excuse for it…there are absolutely tons of qualified minority candidates at all levels for the staffing positions you have available. Now why did it take so long to publish this article? Well, I debated it in my mind for a long time. As an old white guy should I write about this?? Or as the old white guy with a political media platform must I write about this. That weighed heavily on my mind and after conversations with myself and with a number of others, I chose the latter. Some of my better ideas that I had at 3 AM got lost. I mulled things over in my mind for weeks. I have been putting it on ‘paper’ for over a week now. I don’t think I have finished this. It didn’t come out exactly as I had intended. I am not totally happy with it and it’s made me a bit depressed and a bit angry. But I couldn’t let it sit in limbo any longer. And I am sure in my naivety, my ignorance and my inexperience, I have gotten some of this wrong. You need to let me know. And if I have upset you, I apologize. But this shouldn’t be the last word…I’d like to use this to help open and continue the conversation. So please let me know what you think and what you have to say. If you aren’t comfortable commenting in public here…use the feedback function on Blogging Blue and we can have a conversation on the side. This was very difficult to put together. But I don’t think it can be my last post on the topic. In case you missed the GoFundMe link in the quote above: HERE IT IS! Ryan, the Janesville Republican, will be a guest lecturer on “the fundamentals of American government, the current state of political polarization.” He’ll also teach topics including Catholicism and economics. Economics? Paul Ryan knows less about real economics than any of the readers of this blog…he’s the last person that I would think if when considering an economics lecturer. Just because he was self touted as an economic nerd in the House doesn’t make it so. “As an Irish Catholic from the Midwest, the University of Notre Dame has always held a special place in my heart,” Ryan said in a university statement. “It is an honor to be part of a University where Catholic principles, robust debates, academic freedoms and diverse viewpoints are allowed to flourish.